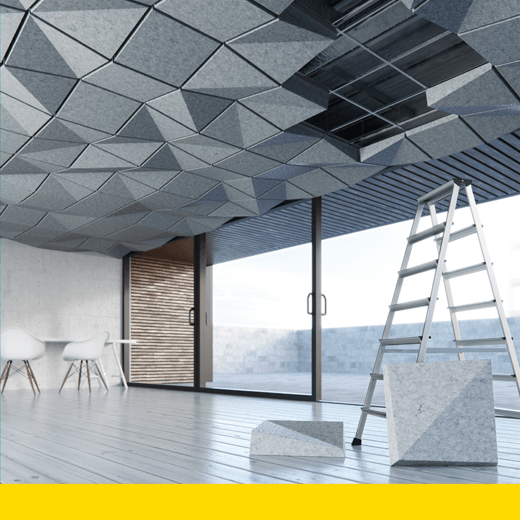 Attaching to ubiquitous drop-ceiling T-grids, the three-dimensional magnetic TURF Acoustic Ceiling Tiles, made from recycled PET, allows for endless customization. Acoustic levels and noise within modern open spaces and hard-surface environments are a constant distraction that impact productivity and focus. Solutions are limited, very expensive and many times require specialized installation. The TURF Acoustic Ceiling Tile System is an intelligent solution to environmental noise that leverages inspiring aesthetics, customer expression and customization, functional design and engineering, low-cost manufacturing, recycled materials, and magnetic plug-n-play contractor-friendly installation onto drop ceiling grids. TURF’s ability to offer functional performance and transformative aesthetics without compromise while complementing existing construction workflows and budgets sets this product apart in the market. Any trade can install TURF: ceiling contractors, painters, electricians, facilities management—virtually anyone.